Want games like Adventure Quest or games like Adventure Quest Worlds? You’ll find both on our list of popular browser based MMO role playing games. Adventure Quest was the original game in the AQ series and launched in 2002. This single player online experience became one of the most popular browser games of the day and led to the development of a sequel game that incorporated more MMO features. This game was dubbed Adventure Quest Worlds (AQW) and become a reality at its full launch in 2008. 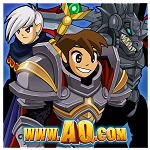 Just like its predecessor AQW grew rapidly and now has millions of registered accounts. The new MMO setting did wonders for the AQ series allowing players to finally see and communicate with each other while also offering greater class depth and a larger variety of quests since the game now had a persistent world to explore. Whether you want a single player game like Adventure Quest or a free to play browser game like Adventure Quest Worlds you will find an option on our list below. The games here focus strongly on free to play browser based games so no software or purchase is required to play.